Thank you again. If you have any other questions or concerns, feel free to contact Bro. Deuel, Pastor, The Israel of God, Atlanta. This lesson will detail the importance of the name of JESUS to the receipt of salvation for ALL mankind. It will start at the beginning of creation and walk down the origin of language and explain the mistake most non-believers have concerning the name in modern Hebrew. 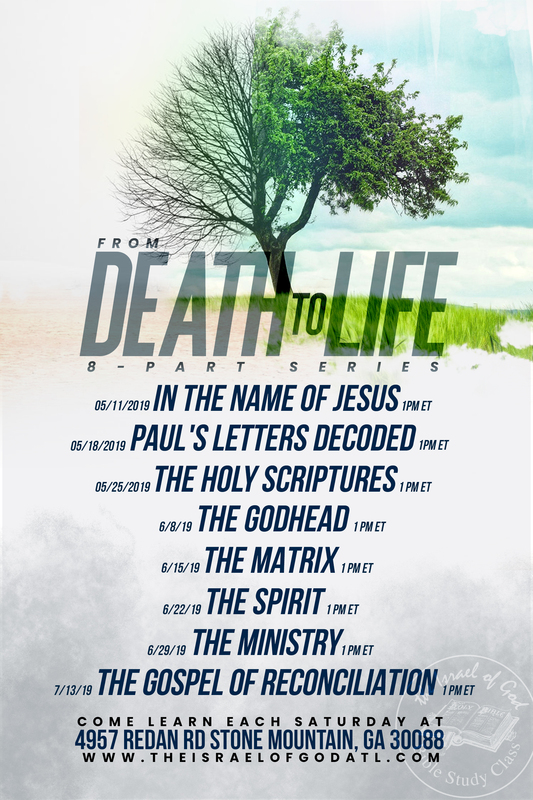 This lesson will “decode”, or explain in detail, the writings of the Apostle Paul to the churches, and the Hebrews, explaining how the keeping the laws of God is imperative to salvation. It will also expose the fallacy that most churches today teach about Paul’s letters. 3. THE HOLY SCRIPTURES (5/25/19) – Bro. Tony P.
This lesson will focus on the importance of understanding what the Holy Scriptures actually are as well as WHICH to use to obtain salvation. It will also touch on, and expose, the false teachings from the Quran and the Apocrypha. This lesson will explore the scriptures that explain the Godhead, the importance of the knowledge of its truth concerning salvation, and discuss the teachings of the doctrine of the Trinity. This lesson will discuss “THE BIG SWITCH” that has been given to the entire world concerning those things that are called holy today in comparison to what the Scriptures actually reveal and their importance to salvation. This lesson will detail the Spirit of God, or Holy Ghost, in its many forms to have the knowledge of each and understand their purpose on the road to salvation. This lesson will detail the ministry of the High Priest, the Levites, and their garments, physically and spiritually. It will also explain our current role today and the garments we need to have to minister the gospel of salvation to all mankind. This lesson will conclude the series, and explain how God is reconciling the world back to Him through Jesus Christ and how his ministers must execute the same mission on one accord.